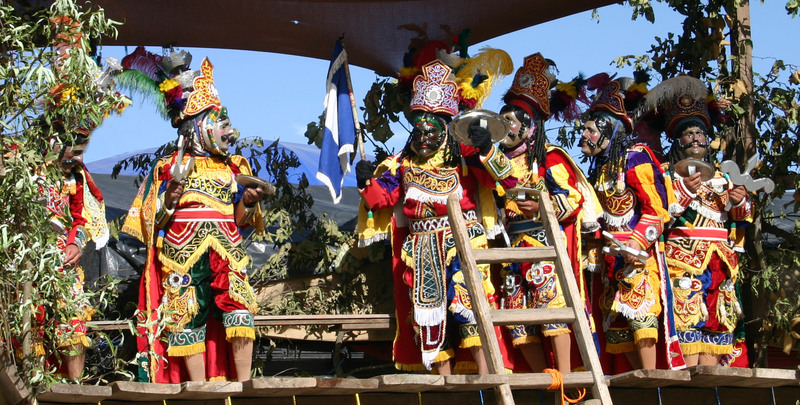 To embody the characters of the drama, dancers wear masks of painted pine wood in the style of the European baroque, they wear costumes of velvet embroidered with sequins, mirrors, braids, and tin foil ornaments; they use ostrich plumes dyed in various colours; and they hold attributes appropriate to their status and function. 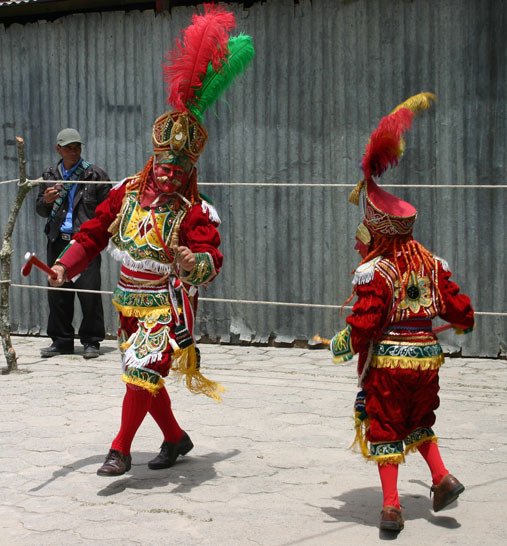 The two ethnic groups, Maya and Spanish, are distinguished by the costume they wear and the attributes they hold. Most Maya characters wear short pants, a shirt that is tied in back, and a long cape of two levels. They wear a tin crown with decorated velvet panels at front and back. They hold a “plato” in the left hand which resembles a shield but serves as a rattle. Spanish characters may wear the same pants as the Maya characters, or plain long red or white pants, depending on the community. In San Cristóbal, they wear the short pants. They wear a military jacket with epaulletes on the shoulders. They wear a brass helmet or a pointed admiralty hat, and they carry a sword with the scabbord attached to their belt. They may also wear white gloves. The Maya priest-diviners represent a third category with a red military garb and distinctive acessories. For much of the action in the dance, different groups of characters occupy different parts of the dance area. The head of the dance area represents the royal palace of the Rey K’iche’ in his capital at Q’umarcaaj (also known as Utatlán). There he appears with his court, represented by two princes and two princesses, the latter called Malinches. At the right side is the palace of the royal heir, Tekum, in the secondary capital of Xelajuj Noj (Xela or Quetzaltenango). There he is joined by the Caciques, leaders of different Maya-K’iche’ communities. At the far end of the right side is the temple on the Santa María volcano used by the priest-diviner Ajitz and his son and apprentice, Ajitz Chiquito. These diviners do not spend much time in their temple but instead circulate freely throughout the centre of the dance area. On the left is the Spanish field camp occupied by the commander, Pedro de Alvarado, and his captains. Continue reading for further information on the mask, costume, attributes and staging for each of these four groups. The Rey K’iche’ (K’iche’ king) resides in his palace at the head of the dance area, flanked by two young princes and two princesses, called Malinches, all of whom carry the royal sceptre. 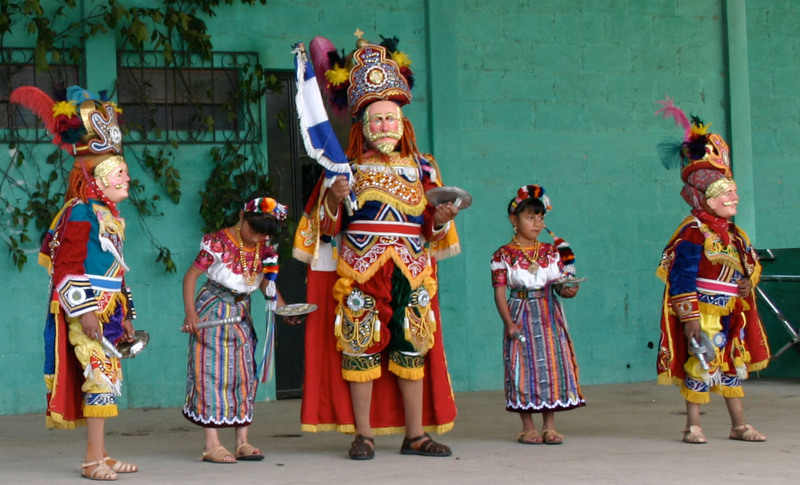 However, the Rey K’iche’ begins and ends the drama dancing with the blue-and-white Guatemalan flag which represents the sovereignty of the K’iche’ nation before the Spanish invasion. The Rey K’iche’s mask is partially bald to show his advanced age, and his brow is furrowed with worry about the fate of his kingdom. 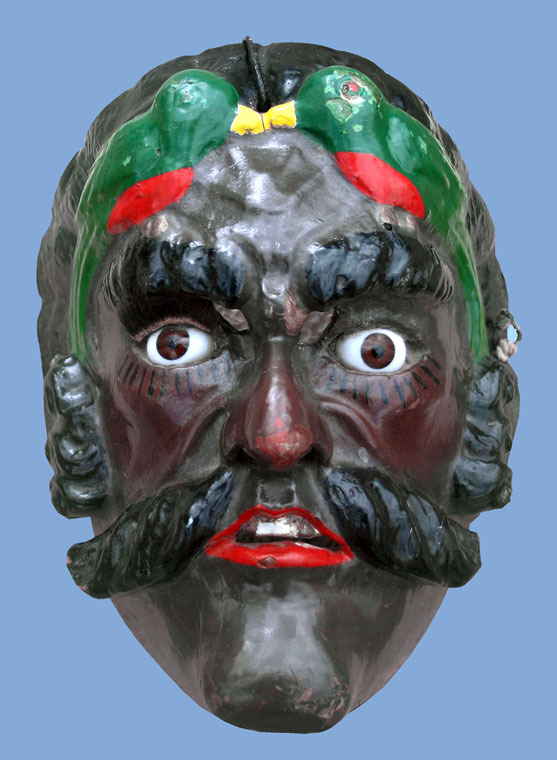 His mask has light skin and golden hair, like those of the Spaniards, but with dark eyes like those of the caciques. 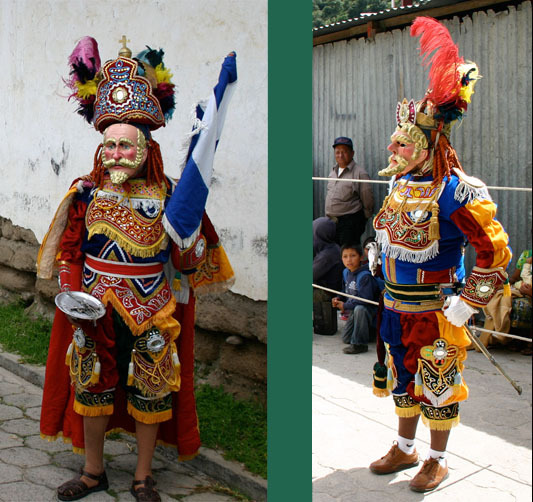 The combination of Maya clothing and “European” masks underlines/expresses his transitional function, as the first to renounce Maya religion and adopt Christianity. The princes are danced by boys. Their masks are likewise light-skinned and blond-haired, with a mustache that represents their gender, not their age. The princesses or Malinches are danced by girls wearing their finest hand-made clothing. (In some communities, they also wear a veil over their face.) The Malinches are the only persons in this dance who sing. The caciques are K’iche’ leaders of high political authority and social rank who also serve as military officers in defending K’iche’ sovereignty. They are shown to be ethnically Maya by their dark skin, black hair and mustache, and brown eyes. The caciques carry an attribute that represents a bow and arrow. Tekum was the heir to the K’iche’ throne and, following K’iche’ tradition, was also the captain general of the K’iche’ army. Tekum carries the royal sceptre until he receives the flag from the Rey K’iche’ as a sign of his military authority. In the late 17th century, the Guatemalan historian Fuentes y Guzmán decided to give him a surname in the Spanish fashion. Since then he has been known as Tekum Umam. Tekum’s mask is noted for its fierce expression as well as the two carved quetzal birds. Tekum also wears a stuffed quetzal effigy on his crown, with the tail hanging down his back. This association of Tekum with the quetzal bird has developed gradually: originally his animal counterpart was the eagle. By the 1870s, it was believed that the quetzal is represented the struggle for liberty, as it cannot survive in captivity. Tekum was understood at this time to be a patriot who fought and died for the freedom of his fatherland. Huitzitzil Zunun is Tekum’s second-in-command. His emblem (and name) is the hummingbird, which appears as an emblem on his headband. The hummingbird is associated with the sun, so he has an aureole of feathers surrounding his face. At times Huitzitzil Tzunun carries the bladed club called macana or macahuitl. Ajitz and Chiquito serve Tekum as his priest-diviners, so they carry a morral or shoulder bag for divination equipment. In Ajitz’s morral he carries the vara, a small bag with red beans and rock crystal used for divination. He also carries a small idol of the storm deity Tohil, the main K’iche’ deity, and he carries a chain that he will use to bind the Spanish emissaries. Ajitz and Chiquito also carry an axe, representing lightning as an attribute of Tohil. The character of Chiquito does not appear in the original text for the dance. Furthermore, the character of Ajitz is written in part as a clown and a coward: both aspects that Maya performers over the centuries have altered greatly. But the clown role has led to another function. The clown character of Spanish plays, the gracejo, has the ability to interact with the audience, and Ajitz uses this ability as a means of controlling the crowd. He thus acts as a kind of policeman, and appropriately wears a military costume (jacket with epaulettes and shako hat) rather than the cape worn by the members of the court and the caciques. 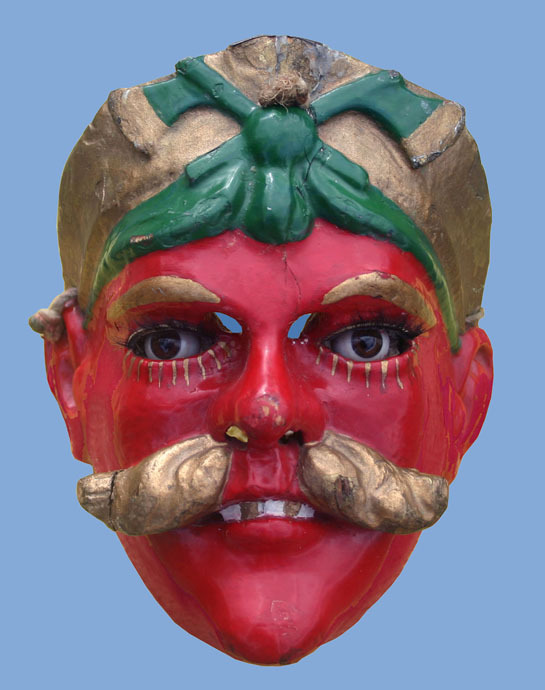 The mask and costume of Ajitz and Chiquito are red. Though the original author, a franciscan missionary, may have intended this to represent the devil, the Maya-K’iche’ recognize the red colour and priestly function as identifying K’aq K’oxol, a powerful entity who inhabits the mountains around the valley of Los Altos. The dance step used by Ajitz and Chiquito is different from that of other characters. The form appears to arise from a mention in the text that he jumps and prances like a goat, referring to the European concept of the devil who has the horns, tail and hooves of a goat. (In the text, the Spanish emissaries threaten to cut off his tail). The Spanish officers are led by Pedro de Alvarado. Following him the two most important officers, who will also serve as emissaries to Tekum’s court, are Carrillo and Cardona. Next is Portocarrero who was named to carry the standard, a lance with the Spanish Flag. The last member of the Spanish force is Don Quirijol who has the part of a gracejo or buffoon. In the text of the dance, he is lower class, cowardly, randy, and a glutton. As noted above, the Spaniards are distinguished by military uniform and helmet or naval hat, and all carry a sword with scabbard except Portocarrero. Although of the Spanish invaders, only Alvarado is known to have been blond haired, all of the Spanish characters in the dance have masks of light skin and blue eyes with blond hair, mustache, and beard, emphasizing a racial distinction from the Maya. 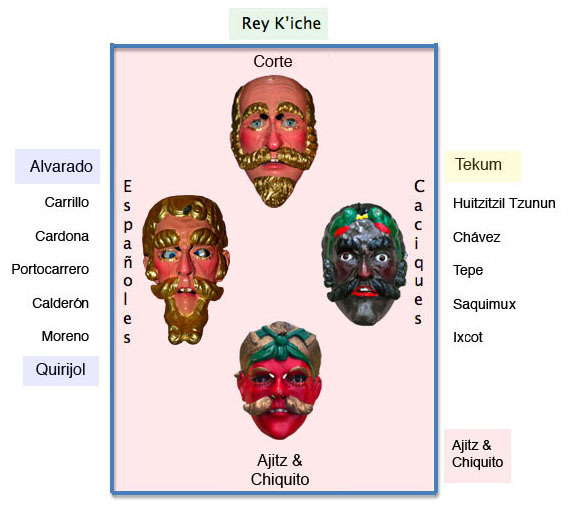 The masks of the different Spaniards are not distinguished, except that in some cases Alvarado, like Tekum, may have a fiercer expression and more aggressive features, as noted by Matthew Krystal. Dance of the Conquest Folkloric Group, San Cristóbal Tototnicapán.